I've been a Bad Babe the past few months. Between traveling over hill and dale for my crazy work schedule and well, being distracted trying to earn an exemption into the LPGA (yea, right..) I have to truthful and tell you that baking bread hasn't exactly been at the top of my list lately. It isn't that the breads the Babes have been baking aren't interesting and when I see the recipes posted in our secret clubhouse, I get all excited. BUT, by the time I find a few minutes to actually sit down and bake, I'm out of time before we are suppose to post. SO, I promise the gals that I will be a "buddy" that month. And you know what happens right? Yup, before I know it I've missed that posting date too! BAD BABE!!! Anyways, last month my very good friend, twin sister and mother of just about the cutest little boy you have ever laid eyes on, Sara at I Like To Cook was our host kitchen and she gave us one of the best breads we've ever done, Potato Bread with Chives. Now, I have to admit when I first read this recipe I thought to myself how can anything "vegan" be really that good. After all, I'm not a huge fan of soy milk but this bread is F.A.N.T.A.S.T.I.C. Sara gave us the option to shape the bread any way we wanted and I opted to make little knots. 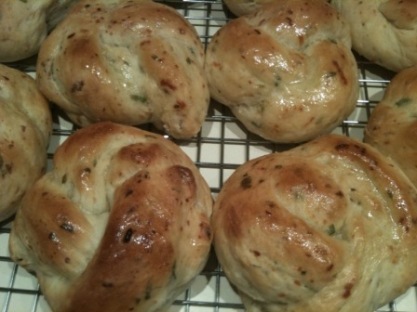 I also added a bit of garlic to the dough to go with the chives and coated the knots with garlic butter when they came out of the oven. They were a HUGE hit when I took them to my watering hole. I love this bread so much, I actually keep single servings of soy milk on hand now so I can make it when ever I want to! This month, Natashya of Living in the Kitchen with Puppies is our host kitchen and she has picked a humdinger of a bread for us this month: Tunisian Spicy Bread. These are like empanadas but with those fantastic middle eastern spices and heat, Heat, HEAT baby!! The dough is made from Semolina flour and is rich and eggy and frankly, really not my favorite dough we've made. But that is OK because it is the filling (chakchouka) that is the star of this bread. A filling made of tomatoes, onions, peppers with chilies, cayenne pepper and harissa, it pushes the bread, which is a bit bland in taste to the background. Which, in my opinon is A-OK. I love the filling so much, I'm glad I made a big batch. I've been dipping corn chips, the leftover frozen Naan that was our January bread this year, carrots and anything I can think of into it. If you want to be a Bread Baking Buddy this month for the Tunisian Spicy Bread visit Natashya's blog for details. 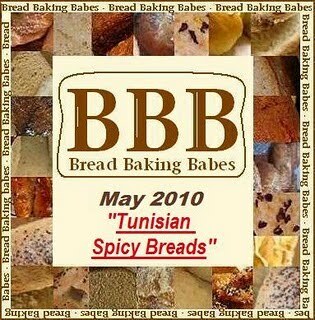 You have until May 24th to get her your post about your experience with the Tunisian Spice Bread and don't worry about the spicy part, she let's adjust the heat to taste. Unfortunately, you can't be a buddy for Sara's bread because the deadline has passed but you should really give the bread a try. I even use the dough for pizza dough! It's that good. And don't forget to visit the rest of the Babes listed over there on my sidebar to see how they shaped their Potato Bread with Chives and how spicy they like things with the Tunisian Spicy Bread. These are a Tunisian spin on r'ghayefs. 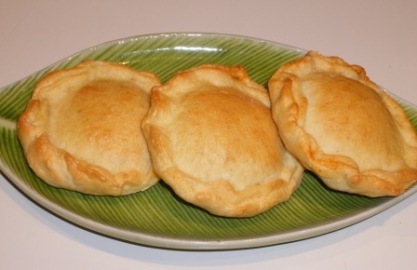 Here the dough is made entirely with semolina flour and enriched with oil and egg, and the filling is enclosed between two circles of dough. The breads are usually pan-fried, but I prefer to bake them. Although the amount of harissa and cayenne pepper in the filling may seem excessive, the heat of the spices is tempered by the bread casing. The filling, which is called chakchouka, may also be served on its own as a salad or a dip. Harissa*, made by grinding chili peppers, garlic, and caraway seeds, is widely available in Middle Eastern markets and in some supermarkets. *or feel free to make your own harissa! There are plenty of recipes online. 1. Dissolve the yeast in 1/4 cup (60 ml) warm water and stir until creamy. 2. Combine the semolina and salt in a large bowl and make a well in the center. Add the 1 1/2 Tbsps (22 ml) olive oil and the egg to the well. Gradually add the yeast and 2/3 cup plus 2 Tbsps (188 ml total) warm water, bringing in the semolina as you go along. Knead until you have a rough ball of dough. 3. Remove the dough to a lightly floured work surface. Knead for 3 minutes. Invert the bowl over the dough and let rest for 15 minutes. Knead for about 2 to 3 minutes more. Cover with a damp kitchen towel and let rest while the filling is prepared. 4. Make the filling: Heat the oil in a sauté pan over medium-high heat. Add the onion and cook until golden. Add the tomatoes, chopped peppers, harissa, and cayenne. Season with salt to taste and cook, stirring occasionally, until the bell pepper is soft and the sauce is very thick. Remove from the heat and set aside. 5. Divide the dough into two pieces and shape each piece into a ball. Place on a lightly floured work surface, cover with plastic wrap, and let rest for 15 minutes. 6. Preheat the oven to 400F (205C). Roll out one ball of dough until it is 1/4 inch (0.6 cm) thick. Using a 3 1/2 inch (8.9 cm approx) pastry cutter, cut out as many circles of dough as possible and set aside. Briefly knead the extra dough together, and place under the plastic wrap, next to the other ball of dough. Turn the circles over and place 1 tsp (5 ml) of filling in the middle of half of the circles. Cover with the remaining plain circles and press on the edges to seal. Flatten the breads slightly by hand and pinch the edges to flatten further and seal well. Brush with olive oil on both sides and transfer to a non-stick baking sheet, or to a baking sheet lined with parchment paper or silicone pastry mat. Cover with a damp kitchen towel. continue making the breads until the dough, including the scraps, is used up. 7. Bake for 12 to 15 minutes, until lightly crisp and golden. Transfer to a wire rack to cool. Serve warm. Note: To pan-fry the breads, heat a little oil in a large pan over medium-high heat. When the oil is hot, place as many breads as will fit in the pan, brush the tops with olive oil, and cook for 3 to 5 minutes, until golden on the bottom, pressing on the breads if they puff up. Turn the breads over, brush the cooked bottoms with oil, and cook for 3 minutes more, or until golden all over. Serve immediately. Seems like the only time there are every any words or action here is when I take charge. Mom has all but abandoned this blog. It isn't because Mom doesn't like cooking or baking anymore. Or that Mom doesn't think about her friends in both the food and cat blogging world. It is just that Mom is so busy these days. You see, Mom's job has her traveling all over. She says it is because the economy is getting better and that is good because it means that there will be more money to buy me all the kitty treats I like but that I had to give up when we economized. Plus all these projects she had last year that go put on hold have all have started up again at the same time and her clients think that just because they put the project on hold Mom kept working on them so she should be able to deliver their sound system designs on the same time schedule as the original schedule. She laughs when they say that. 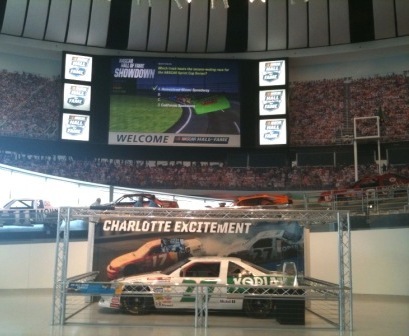 Anyways, last week Mom was traveling to Charlotte, NC because the NASCAR Hall of Fame opened and she did the audio and video systems for the museum. It was a really cool project and Mom even got a chance to drive a race car simulator. She didn't do so good though except for crashing the car really spectacularly. When she stepped out of the simulator she said people started clapping because they show the crashes on a big video screen outside and her crashes were so good. That's my Mom!! 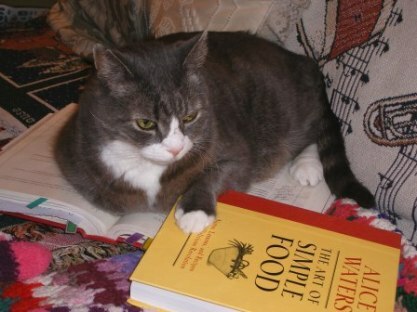 When Mom got home on Thursday, I was so happy to see her that when she sat down on the couch to find a recipe to make some pizza dough, I had to sit on her cookbooks. 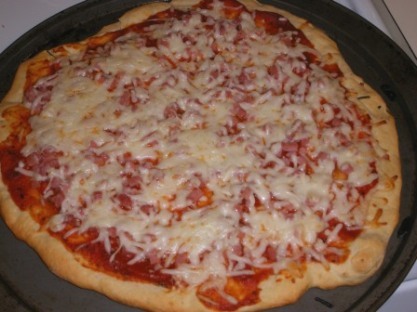 But Mom found a great pizza dough recipe she had never tried before anyways and made this really great looking pizza. I didn't try any of it because she doesn't like anchovies and didn't put any turkey pepperoni on it for me. 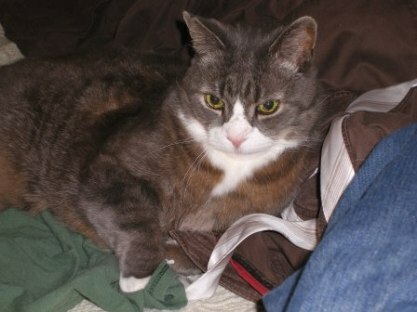 We're hosting Weekend Cat Blogging this weekend and we would love to see what the other kitties are doing. So, leave us a comment with your link and check back at the end of the weekend to read the comments! Now if you will excuse me, I have some window sitting to do and Mom has a golf game (of course! ).